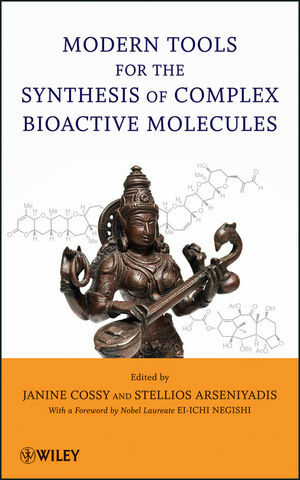 Focusing on organic, organometallic, and bio-oriented processes, this book explores the impact and use of the latest synthetic tools for the synthesis of complex biologically active compounds. Readers will discover step by step how these synthetic tools have provided new, elegant solutions to many synthetic puzzles. Moreover, they will discover innovative methods that make it possible to control the exact connectivity of atoms within a molecule in order to set precise three-dimensional arrangements. The last two chapters explore target- and diversity-oriented organic synthesis as well as the use of DNA-based asymmetric catalysis, which are all promising tools for the successful synthesis of complex bioactive molecules. Modern Tools for the Synthesis of Complex Bioactive Molecules is ideal for students and researchers who need to plan and perform the synthesis of complex molecules as efficiently as possible. The book's expert advice will help these readers quickly resolve a broad range of problems that can arise in organic syntheses. JANINE COSSY graduated from the University of Reims working under the supervision of Prof. Jean-Pierre Pète. After a postdoctoral stay with Prof. Barry Trost (1980-1982) at the University of Wisconsin, she returned to Reims where she became Director of Research of the CNRS in 1990. The same year, she moved to Paris to become Professor of Organic Chemistry at the Ecole Supérieure de Physique et de Chimie Industrielles de la Ville de Paris (ESPCI ParisTech). She has published over 380 articles and filed thirteen patents in the field of synthetic organic chemistry and natural product synthesis. She is Associate Editor at Organic Letters since 2005. STELLIOS ARSENIYADIS was born in Greece in 1975. He studied chemistry at the Université Paris XI and received his PhD in 2002 from the Université Louis Pasteur (Strasbourg, France) working under the guidance of Dr. Charles Mioskowski. In 2001, he joined Rhodia ChiRex (Boston, USA) for an eighteen-month internship in collaboration with Prof. Stephen L. Buchwald (MIT, USA). He then spent a year as a postdoctoral fellow at Imperial College London (UK) working under the supervision of Prof. Alan C. Spivey, after which he joined Prof. K. C. Nicolaou's group at The Scripps Research Institute (La Jolla, USA) for an additional postdoc. In 2005, he was appointed by the CNRS as Chargé de Recherche in Prof. Janine Cossy's group. His research interests include the development of new synthetic tools and their application to the total synthesis of complex natural products.